Images, news and opinion from the around the Bay of Fundy area and beyond. Re-introduce time-honored shifting and rotating aquaculture/agriculture practices (Egyptian Model). Phrases like “lessons from the past” or “learning from ancient history” are apt to make our eyes glaze over, and we flash to memories of boring history classes or droning TV documentaries. But in the case of aquaculture, a little historical knowledge can be both entertaining and enlightening. Fish farming is not new; it has been practiced for centuries in many cultures. Ancient Chinese societies fed silkworm feces and nymphs to carp raised in ponds on silkworm farms, Egyptians farmed tilapia as part of their elaborate irrigation technology, and Hawaiians were able to farm a multitude of species such as milkfish, mullet, prawns, and crab. Archaeologists have also found evidence for aquaculture in Mayan society and in the traditions of some North American native communities. largest producer of aquacultural products. rich and varied diet when they were not in Rome. Fish like mullet and trout were kept in ponds called “stews.” The stew pond concept continued into the Middle Ages in Europe, particularly as part of the rich agricultural traditions at monasteries, and in later years, in castle moats. Monastic aquaculture was devised, at least in part, to supplement declining stocks of wild fish, a historical theme that resonates dramatically today, as we confront the effects of declining wild fishstocks around the world. Societies have often used aquaculture to adapt to growing populations, changing climate and cultural diffusion, in sophisticated and sustainable ways. Historical examples can inspire us to encourage aquaculture which is environmentally sustainable and which discourages the use of antibiotics and the destruction of wild sea populations. 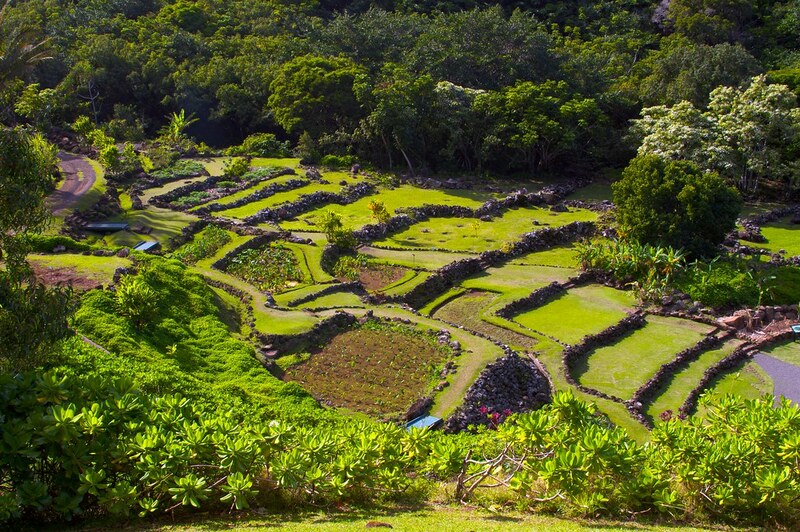 For example, taro fishponds in the uplands of Hawaii were used to grow a wide range of salt-tolerant and freshwater fish, such as mullet, silver perch, Hawaiian gobies, prawns and green algae. The ponds were fed by runoff streams from irrigation as well as hand-made estuaries connected to the nearby sea. They were highly productive, thanks to the replenishing water sources as well as mounds of hand-planted taro plants around the edges, which attracted insects for fish to eat. Hawaiians also created more elaborate brackish-water aquaculture techniques as well as seawater ponds to farm ocean fish. Seawater ponds were created by the construction of a seawall, often made up of coral or lava rock. Coralline algae gathered from the sea were used to strengthen the walls, as they act as a natural cement. The seawater ponds contained all of the biota of the original reef environment and supported 22 species. Innovative canals constructed with wood and fern grates allowed water from the sea, as well as very small fish, to pass through the wall of the canal into the pond. The grates would prevent mature fish from returning to the sea while at the same time allowing smaller fish into the system. Fish were harvested at the grates by hand or with nets during the spring, when they would attempt to return to the sea for spawning. The grates allowed ponds to be continually re-stocked with fish from the sea and cleaned of sewage and waste using natural water currents, with very little human involvement. Ancient Egyptians devised a land-reclamation method around 2000 BCE which is still highly productive, reclaiming over 50,000ha of saline soils and supporting over 10,000 families. During the spring, large ponds are constructed in saline soils and flooded with fresh water for two weeks. The water is then drained and flooding is repeated. After the second flooding is discarded, the ponds are filled with 30cm of water and stocked with mullet fingerlings caught in the sea. Fish farmers regulate the salinity by adding water throughout the season and there is no need for fertilizer. About 300-500kg/ha/year of fish are harvested from December through April. Diffusion takes place where the low salinity standing water forces the higher salinity groundwater downward. Each year after the spring harvest the soil is checked by inserting a eucalyptus twig into the pond’s soil. If the twig dies the land is used again for aquaculture for another season; if the twig survives farmers know the soil has been reclaimed and is ready to support crops. This aquaculture method reclaims soil in a three to four year period, compared to 10-year periods required by other practices used in the region. Some of the ancient aquaculture in China and Thailand took advantage of what is now referred to as integrated multi-trophic aquaculture (IMTA). IMTA systems allow the uneaten feed and waste products of a desirable, marketable species, such as shrimp or finfish, to be recaptured and converted into fertilizer, feed and energy for farmed plants and other farm animals. IMTA systems are not only economically efficient; they also mitigate some of the most difficult aspects of aquaculture, such as waste, environmental harm and overcrowding. In ancient China and Thailand, a single farm might raise multiple species, such as ducks, chickens, pigs and fish while taking advantage of anaerobic (without oxygen) digestion and waste recycling to produce thriving terrestrial husbandry and farming that in turn supported thriving aquaculture farms. LNG: Good for the environment … really? PLEASE NOTE: Ads for the OIL & GAS industry don't reflect the position taken on this blog. They are chosen by Google based on the topics of conversation. Check them out. Who knows what can be learned.